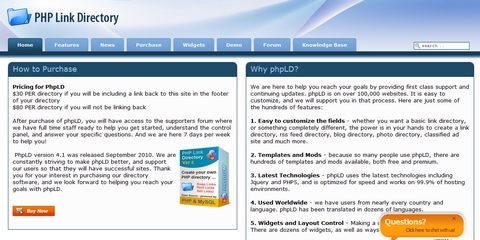 phpLD is one of the most widely used directory scripts on the internet, installed on over 100,000 websites. Also, you will find a wealth of resources that allow you to create a directory the way you want it, and get support along the way on the site. There are dozens of directory templates, mods and widgets allowing you make something special. Keep in mind that while phpLD can be used strictly as a directory script, it is versatile enough to be used for many other purposes. For example, phpLD works well as a business directory script with its integration with google maps. But it also work well as a blogging or article directory script, allowing both the posting of articles by multiple authors, and commenting by users. phpLD is very kind to giveaway 3 x Unbranded Version phpLD Licenses ($80 each). Simply leave a comment and tell us what you are going to use the directory script for. We will pick 3 lucky person and announce the winners on 19th September. What are you waiting for? Thank you for all of the participants of Giveaway 1 x Custom Logo Design By LogoBee. We are happy to announce the following winner. Congratulations. You will receive an email about how to claim your prize. LogoBee creates logo designs for all types of businesses all over the world. They have a logo design team of professional graphic designers, working to provide your organization with the most unique, and modern company logo. At their design company they combine all their logo designer skills to provide you with a custom logo design which will portray your company’s philosophy. You can choose from 6 to 8 different logo design samples. You will receive a complete logo design kit including vector and common file types. Lifetime logo design and stationery file support are provided as well. You can take a look at the logo design they have done in the past within portfolio. LogoBee is very kind to giveaway 1 x Custom Logo Design to our readers. Simply leave a comment and tell us what you are going to use the Logo for. We will pick 1 lucky person and announce the winners on 29th August. What are you waiting for? JumpeyeComponents has launched SlideshowBox recently. SlideshowBox comes with 24 professionally designed photo slideshow templates. There is no coding required. Everything can be easily customized through the FlashEff-like interface with no more than a few clicks. They work hard to make your job easier. 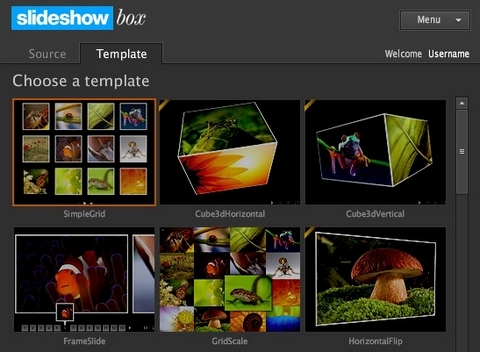 SlideshowBox is a web development product that is fun and easy to use! JumpeyeComponents is very kind to giveaway 3 x Slideshow Box Premium HTML License ($99 each) to our readers. Simply leave a comment and tell us what you think about Slideshow Box. We will randomly select 3 lucky people and announce the winners on 15th August. What are you waiting for? Please note that the Free Version is always available for download. It includes a cool preset for each photo slideshow template but it doesn’t feature any customization options. The free version can only be used for non commercial purpose, it includes a context menu item (“About SlideshowBox.com”) and it has no time limitations. Thank you for all of the participants of Giveaway 3 x Professional Licenses of Formstack. We are happy to announce the following 3 winners. Congratulations. Formstack will contact you guys shortly with the instruction of getting your free 12 months subscriptions. 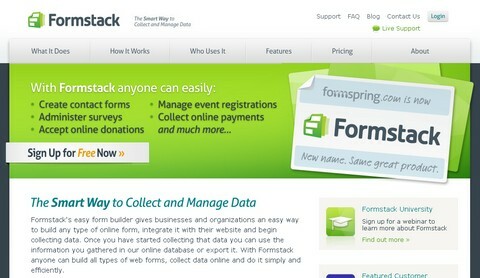 Formstack provides organizations with an easy way to build web forms that integrate with their websites without any programming, software, or special skills. Formstack allows you to add any field type including name, email address, radio buttons, and more. Plus, you can easily drag-and-drop fields to customize web forms to fit your organization’s need. There are some powerful, customized tools that allows you to quickly create almost any type of form imaginable. Once you have started collecting data with Formstack, you can manage and edit the information online, share data with others in your organization, and even use the API for greater control of the data and integration with your internal database. You can always try their free account and see how easy it is to get started! Formstack is very kind to giveaway 3 x 12 months Professional Licenses ($348 each) to our readers. Simply leave a comment and tell us what you think about Formstack. We will randomly select 3 lucky people and announce the winners on 25th April. What are you waiting for? Thank you for all of the participants of Giveaway 3 x Medium Yearly Plan of Vyoopoint. We are happy to announce the following 3 winners. Congratulations. Vyoopoint will contact you guys shortly with the instruction of getting your free subscriptions. Vyoopoint was born from the need to elegantly and quickly present design work to your clients. It provides a better way to deliver designs (images, video or Flash) and gather notes/comments from the client. With Vyoopoint, uploading and presenting visual material to anyone else is now a snap! Vyoopoint was designed and built by visual artists, for visual artists, so the interface has been kept to a minimum, which makes sure that the work being presented is what is really going to be noticed by the client. It is easy to use and not cluttered with buttons, panels and unnecessary text. It also keeps all your client work organized by project and version controlled with date stamps so you always know what revision is the most current with a project history at your fingertips. They do have a Free plan with 1 Active Project with 5 Galleries. It allows up to 75MB with unlimited users and clients. All your files are safe and will remain password protected unless you publish a ‘public’ (not password protected) gallery. It also support Basecamp integration as well. dsire is very kind to giveaway 3 x Medium Yearly Plan ($288 each) of Vyoopoint to our readers. Simply leave a comment and tell us what you think about Vyoopoint. We will randomly select 3 lucky people and announce the winners on 4th April. What are you waiting for? Thank you for all of the participants of Giveaway 5 x Professional Licenses of FusionCharts v3. We are happy to announce the following 3 winners. Congratulations. FusionCharts will contact you guys shortly with the instruction of getting your free subscriptions.